I tried a little experiment germinating seeds in a container and open to the outside elements as opposed to placing them in a controlled environment inside the house using a mini greenhouse, artificial light, and bottom heat. 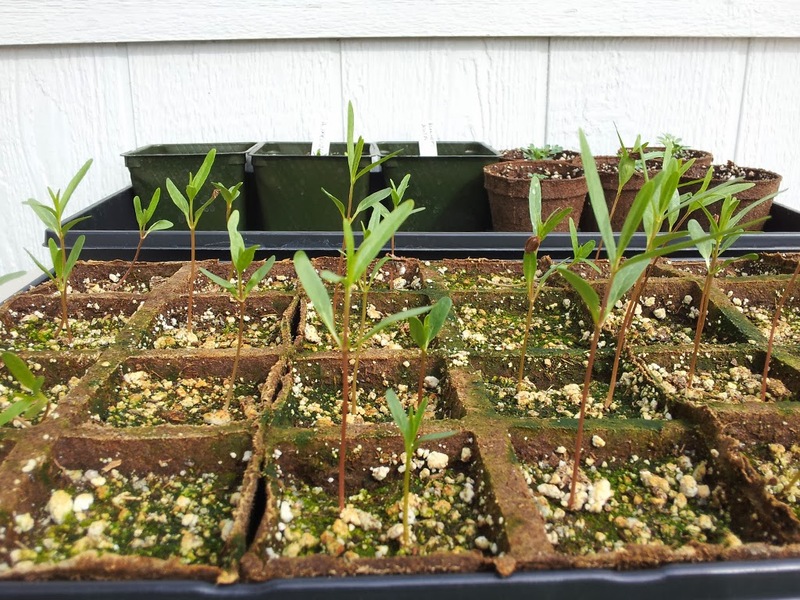 The above photo shows some Asclepias speciosa, or Showy Milkweed that was germinated in a controlled environment. The photo below shows plants from the same seed batch planted in small containers and placed outside. Both were planted on 12/31/2013. Photos taken 1/30/2014. BIG DIFF! 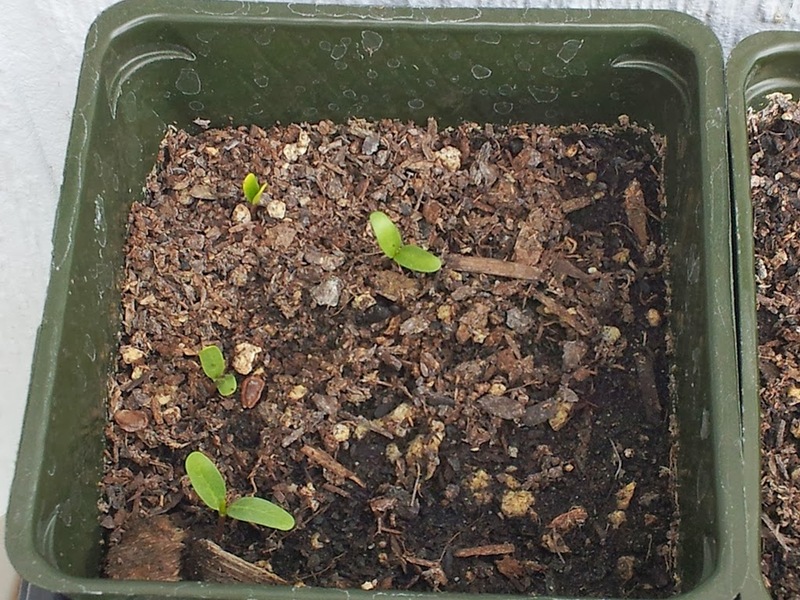 Those planted outside have barely germinated; only their cotyledons (rudimentary seed leaves) have sprouted. Those grown under guarded conditions are sporting secondary and even tertiary leaves, way more advanced than their outdoor grown siblings. Most of these plants will be donated to my friend Tom who lives on five acres above Murrieta, California. 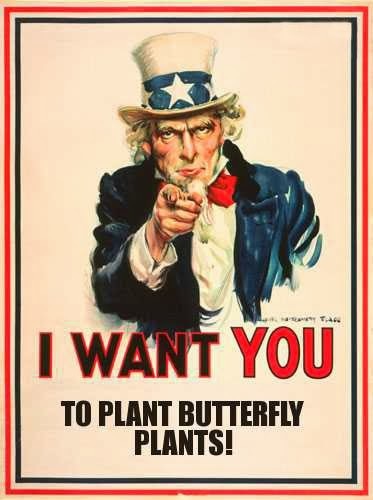 I'm also going to start up some Asclepias eriocarpa for the property. Tom is very excited about incorporating native plants, especially those with interesting flowers that support butterfly populations. I'll be keeping a few of each species for my own containers at home. The container garden is coming along nicely. The unseasonable warm spell we experienced recently has helped tremendously in allowing plants to experience gain early, flourishing in a more conducive to growth environment. Many of the plants I purchased months ago and nursed along are in pots or will be soon. Once everything is placed in their containers, it will be time to arrange them in the garden. Right now, most of the containers are bunched up in a staging area so I can get an idea of what I have before positioning them. Wonder which of the siblings will do better in the ground for the long haul. You going to follow them after their debutante ball is over? Good to hear from you. Winter has been mixed up a bit this year.